Moong dhal or split green gram can be used to make sambar, which goes well with idly/dosa or steamed rice. Here’s an easy method of making this simple sambar. 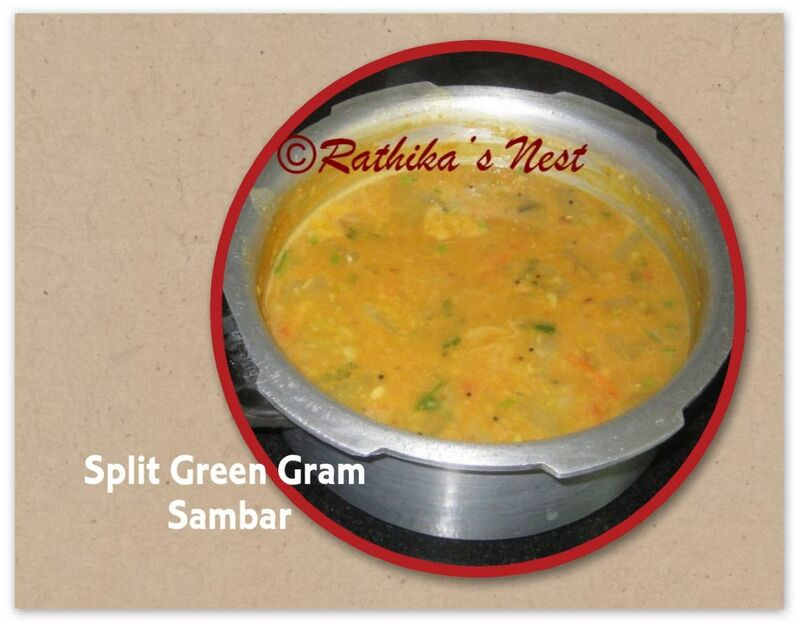 On a routine day, this sambar would be an ideal accompaniment for breakfast! Method: Heat 2 teaspoons of oil in the pressure cooker; add chopped onion and sauté till the pieces become transparent. Add washed moong dhal and top it with cut vegetables. Add 1 teacup of water and pressure cook for 5 whistles. Switch off the stove. Once the pressure subsides, open the lid and mix the contents well. Keep aside. In a separate vessel, dissolve the tamarind paste in 1 teacup of water; add sambar powder and salt; mix well. Bring this mixture to boil and then, simmer for 2 minutes. Now add this mixture to the contents of pressure cooker. Mix well and bring it to boil. Switch off the stove. Heat 1 teaspoon of oil in a wok/kadai, add mustard and cumin seeds, and when they start to sputter remove from fire. Add this seasoning to the sambar. Garnish with coriander and curry leaves. Your moong dhal sambar is ready!